The other side of holos: Shaka Hologram Green | Light Your Nails! Cristina and I are almost to the end of this series of posts featuring holos. I hope you liked seeing the same polishes from different perspectives. Today we have a super strong holo from one of my favourite Italian brands. Meet Shaka Hologram Green (original version - A). Shaka holos were released in limited edition a few years ago. It was quite obvious just by looking at the bottles that the linear effect in them was extremely strong. They are old-school holos, i.e. they need an aqua base otherwise they are runny and really tricky to paint. Pay-off is fantastic though. Ormai siamo quasi alla fine di questa serie di post gemelli a tema olografico. Spero che vi sia piaciuto vedere gli stessi smalti da due punti di vista diversi. Oggi Cristina e io abbiamo scelto un holo di uno dei miei brand italiani preferiti: Shaka Hologram Green (versione originale – lotto A). La collezione olografica Shaka è uscita qualche anno fa in tiratura limitata. Bastava guardare la boccetta per capire quanto fosse forte l’effetto holo. Sono smalti olografici del vecchio tipo, ovvero difficili da stendere senza una base apposita perchè ogni strato porta via quello appena steso. Il risultato però è stupefacente. 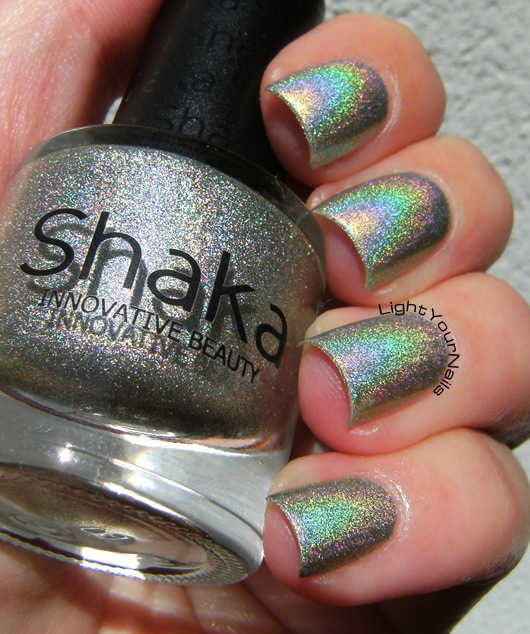 Shaka holos re-appeared on the shelves after a while but they were reformulated to scattered holos. That was no nice surprise. The green original one wasn’t as popular as the other shades though and I still happen to see it in store every now and then. I know the colour isn’t original for a linear holo from a mainstream brand but it’s the cheapest and strongest we can find in Italy for sure. You can’t beat 1,99€ for 5ml! And now off to see it on Cristina’s nails. I am kinda sure her rainbow is longer than mine haha! Gli smalti olografici Shaka sono riapparsi sugli scaffali dopo un po’ ma con una sorpresa! Non erano più di tipo olografico lineare ma sparso. Il verde però non deve essere piaciuto come gli altri colori perchè io continuo a trovare la versione originale all’OVS. So che questo colore non è granchè originale per un olografico lineare a meno che non si spazi nell’universo degli smalti indie. Però non si può proprio battere 1,99€ con un risultato del genere. E adesso passiamo da Cristina, scommetto che lei ce l’ha più lungo, l’arcobaleno! This is as good as Nfu.Oh and far less expensive than Layla holos. Yes, I think it can be a dupe to Nfu Oh! I only have two Nfu Oh holos and I really need to compare to the Shaka's of the same colour! Layla's are terribly expensive but they have some pretty shades which are a bit more unique! Sigh :( Se vuoi ci guardo la prox volta che passo all'OVS se trovo dei lotti A. Non ne hai nessuno? Love your presentation. You showed us today how versatile and beautiful this polish can be. I love it! That holo! So amazing! And awesome you can find it in store :). Planning my trip to Italy. I need all these beauties you've been showing! I miss this kind of intense holo sometimes. They're totally worth the effort with the aqua base. I want to pull out my Layla polishes now! Layla's are quite the same, right? Definitely worth using and investing in an aqua base! OHHHHH so sparkly!! I started to fall out of love with holos when everyone started doing them. Now, they are everywhere they are underwhelming to me. This is gorgeous! Super sparkly and super pretty! Yes, they are everywhere indeed. But still I am never tired of them! holy cow! This is unreasonably beautiful! Yum this is so pretty!! It's a shame they reformulated it though. I've never had a holo I needed an aqua base for though!! HOLY HOLO BATMAN!!! This is possibly the sparkliest holo flame I have ever seen in a polish. Thank you! Shaka holos are all like this, the flame lets you forget the colour are quite basic! Oh my, that is AMAZING! I love it! You are seriously the best at capturing holos! Love your swatches.